By stayhomecupcake on June 14th, 2012 . Filed under: Cupcake Ideas, Decorating, Holidays . In my house I may do most of the cooking but when it comes to grilling, that’s 100% my husband’s job. I found these totally perfect cupcakes at Wilton.com and I instantly fell in love. Not only would they be a great Father’s Day cupcake idea, but these would also be great for a 4th of July picnic too. 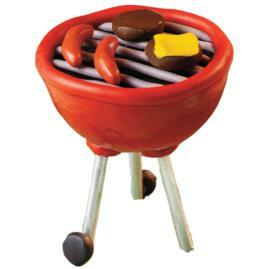 You could also modify this a bit by adding fondant hotdogs, corn on the cob and other veggies. They may each take a while to make, but check out the baker reviews for some time-saving tips.